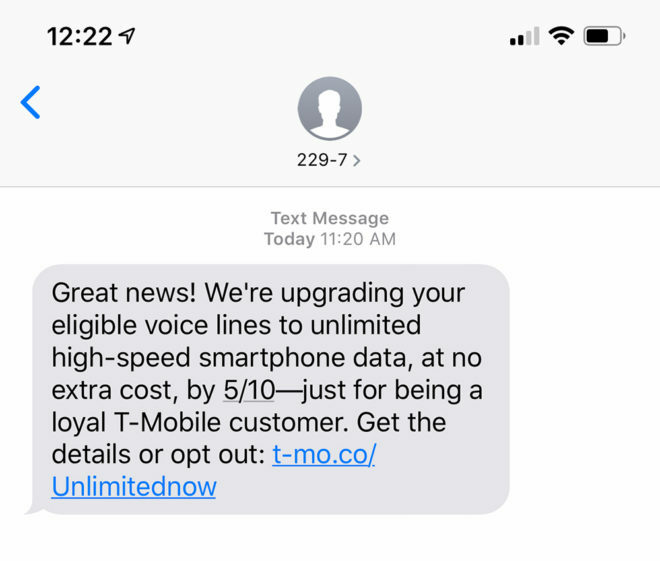 After upgrading some Simple Choice customers to unlimited high-speed smartphone data earlier this year, it looks like T-Mo is now making another round of upgrades. Several T-Mobile customers on Simple Choice plans are receiving a text message telling them that their voice lines are being upgraded to unlimited high-speed smartphone data. There’s no extra charge for the upgrade. T-Mo says that customers receiving the upgrade will see their eligible lines get unlimited high-speed smartphone data by May 10th. With this upgrade, you will lose your Data Stash. You’ll continue to get high-speed tethering data at your previous high-speed data allotment. For example, if your high-speed data allotment was 6GB before your unlimited upgrade, you’ll have 6GB of high-speed data tethering each month followed by unlimited tethering at 2G speeds. If you receive this upgrade from T-Mobile, your eligible voice lines will be automatically upgraded to unlimited high-speed smartphone data. You can opt out of the upgrade if you prefer your current plan setup, though. Just head to this page and fill out the form by April 30th. “We have done these types of upgrades for customers before and this is just a way to say thank you for being a loyal T-Mobile customer. Have you gotten a text from T-Mobile that says you’re being upgraded to unlimited high-speed smartphone data? How about they upgrade Simple Choice Customers to “NETFLIX ON US” for loyalty?? I up one better,how about giving netflix for everyone,I am on 55 plus plan don’t have that. Are you telling me more half your customers are 55 plus? We don’t have access to it and we have an “upgraded” plan. If they did it for y’all, they’d maybe have to do it for Select Choice customers as well to keep it simple (pun not intended). Only for lines that have a paid data plan. Just talked to them. Will all the paid lines get upgraded? I just got the text this morning … I don’t see a big downside in doing this. Am I missing anything? My guess is video streams will be limited to 480p. it would be like you have binge on enabled 24×7. Nope. I turned BingeOn off when I was upgraded from 10gigs to unlimited and now stream 1080p+. And I kept my 15% government discount. Tethering. With simple choice 10gb plan tethering is at LTE speeds. By switching to this unlimited upgrade, tethering goes to 2g. That’s a deal breaker for me. Especially when data stash gives me 30 GB per month to work with. I never use that much data in a month. Actually I may not be correct on the tethering. I was going by what the article said. After logging into my account, it says I continue to keep “high speed” mobile hotspot (tethering). I haven’t tested the speed yet since the change, but I don’t count 2g as “high speed”, so that may be good. Looks like 480p video is the only downside but I haven’t noticed any issues with that on my devices. Tethering is at whatever “high speed” limit you previously had. So if you were on a 10gb plan, you get 10gb of full LTE speed tethering. There is no 480p video limit. You can turn off “binge on” for no charge, allowing full video resolution. If you get the text then yes. I have select choice and i already have unlimited. Which select choice do you have? I only have 1 line. Try upgrading to a device that has Band 12 and Band 71, you’ll probably get connected. I personally have only good things to say about T-Mobile and I have been with them for over 7 years. I’ve also had many friends migrate to TM and all are still with T-Mobile. The question is what about those on the old SC Unlim 2 for $100 promo. It seems as though these customers are now being brought up to the same level as the old promo plan, including 1080p streaming video, but at at a far cheaper price, especially if you have additional lines at the $40 each. I’m still on Select Choice from the first time they did all this. Our phone bill is really cheap and we already have unlimited unlimited LTE on our lines from waaaay back when they first released unlimited for the MyTouch era. They also added 5GB of tethering for free for each line. I was notified of the upgrade this morning. I’ve been a TMO customer for only 3 yrs. I don’t need more data. 10GB is more than enough for me. But it’s nice to be appreciated. Now, how about some device discounts for loyal customers, TMO?? Unfortunately not even employees get discounts on devices. The only thing they get discounted are their rate plans. Tmo should just give some discounts for the Simple Choice customers to move to the ONE plan. Maybe match the new customer deals. Yeah. I couldn’t switch to the 4 lines for $140 One plan. I was told that I could only get the regular price of $160 for 4 lines. Dumb. I was told the same thing, and I refuse to switch to paying $160. I haven’t received the text but my wife received it yesterday, not sure if any of the other lines got the text. It’s not like they are really doing me any favors for this, don’t need it so it’s useless. We got the upgrade when the first round of these went out a few weeks ago. However, the claimed date of the upgrade came and went with no change to my plan visible on the TMo website. I contacted twitter support, and they had to do something to make the unlimited data show up the next day. Just FYI in case this happens to others.